Published Sunday, November 4, 2007 in The Island Packet Newspaper, Hilton Head SC. You give up a lot when you become parents. Right away it’s basics like sleep and free time, followed by luxuries like romantic evenings out and eating dinner on the couch. And that’s before the kids can even talk. Hilton Head Islanders Dan and Tryna Fitzpatrick, both 37, are eight years into this journey called parenthood, which means they’re beyond those initial sacrifices. They’re giving up their Jaguar S-Type sports car by donating it to Hilton Head’s annual fundraising auction. The car will be sold at auction and 100% of the proceeds will go to the school. “There’s no room in a Jaguar’s back seat for three kids,” says Dan matter-of-factly. So the Fitzpatrick’s are donating their beloved luxury car to the upcoming fundraiser at the school where their oldest daughter attends. Proceeds from the fundraiser help to broaden the school’s academic and teacher programs, while also providing scholarship and stewardship opportunities for those in the community. The Jaguar S-Type, will be part of a live auction that features getaway vacations to the Bahamas and Scotland, among other posh prizes. 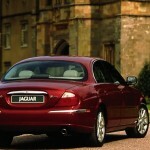 But make no mistake: The Jag will be the highlight. The car is a remnant of the Fitzpatricks’ former life, one that involved lazy weekends spent scuba diving with friends in the Florida Keys where they lived. That life didn’t include three children under the age of 9. It was a life without car seats and sudden spills. It was a life the Fitzpatrick’s never expected to leave behind. They had fun with the car for a while, but over the years their priorities shifted. When Ashlynn came along, and then Addison, they found fewer occasions to take it for a spin. Eventually, they bought a minivan. ”We call it Black Magic,” Tryna says of their practical family vehicle. “We thought if we got a black one it would pass for ‘cool.’” To fellow parents, perhaps. The Fitzpatrick’s moved to Hilton Head three years ago after searching up and down the East Coast for just the right community. ”Tryna and I were looking for a real family-friendly place that would also provide us with good expansion opportunities for our growing business and our family,” Dan says. Finding a good schools “was like a weight lifted off our shoulders,” Tryna says. They are proud supporters of Hilton Head schools, operating a busy school uniform store and being active in the school’s parents’ association. The couple also own a successful digital marketing business, 3-A-Media.com, with clients that include the Federal Government, HHI Chamber of Commerce, the Lowcountry travel association and a growing list of local restaurants, hotels, shops and banks. Published Sunday, November 4, 2007 in The Island Packet, shared with permission. Click here for an excerpt of the original article.